DO CLAIR CHATTER AND NOOSPHERIC DISTURBANCE HAVE TO DO WITH DISTURBANCE IN EARTH’S MAGNETOSPHERE AND IONOSPHERE? The last few days were quite a weekend for noospheric unrest and clair chatter. On Friday night I hardly slept for the odd things happening in my personal electromagnetic field. I got a telephone alert from “Space Weather” … www.spaceweather.com … at about midnight on Friday night, 16 March 2019. It did not wake me up, as I had not been able to get to sleep for the psychic commotion. That naturally gave rise to the question: Do clair chatter and noospheric disturbance have to do with disturbance in Earth’s magnetosphere and ionosphere? Image: “Post Apocalypse, Maybe? 😉 ” by Markus Varik, 16 March 2019, Tromso, Norway … http://0e33611cb8e6da737d5c-e13b5a910e105e07f9070866adaae10b.r15.cf1.rackcdn.com/Markus-Varik-Greenlander.no-3707_1552786701_lg.jpg ..
As you may know, the 2019 Spring Equinox is this Wednesday, 20 March 2019. According to the “Space Weather” article, these types of geocracks are characteristic of the Spring and Autumn equinoxes; thus the term ‘equinox cracks’. Link: “How the Body Uses Electricity: Electricity is everywhere, even in the human body. Our cells are specialized to conduct electrical currents. Electricity is required for the nervous system to send signals throughout the body and to the brain, making it possible for us to move, think and feel.,” by Amber Plante, in Graduate Student Association, at University of Maryland Graduate School … https://www.graduate.umaryland.edu/gsa/gazette/February-2016/How-the-human-body-uses-electricity/ ..
Link: “Magnetic Field Influence on Central Nervous System Function,” by AD Rosen and J. Lubowsky, in “Experimental Neurology,” 1987 Mar;95(3):679-87. Abstract … https://www.ncbi.nlm.nih.gov/pubmed/3817086 ..
Link: “The Effect of Magnetism on the Nervous System,” in “Magnetic Therapy Bracelets” … http://www.magnetic-therapy-bracelets.com/effect-of-magnetism-on-nervous-system.html ..
Link: “Magnets for Pain,” by National Center for Complementary and Integrative Health Care, NIH … https://nccih.nih.gov/Health/magnets-for-pain .. So then, broadly speaking, I gather that the electric force facilitates nervous system messages, and that static electromagnetic fields have a pain-dampening, and perhaps also a nervous system message-dampening effect. “The magnetosphere is the region above the ionosphere that is defined by the extent of the Earth’s magnetic field in space. It extends several tens of thousands of kilometers into space, protecting the Earth from the charged particles of the solar wind and cosmic rays that would otherwise strip away the upper atmosphere, including the ozone layer that protects the Earth from harmful ultraviolet radiation. “Electric currents induced in the ionosphere generate magnetic fields (ionospheric dynamo region). Such a field is always generated near where the atmosphere is closest to the Sun, causing daily alterations that can deflect surface magnetic fields by as much as one degree.” –from “Earth’s Magnetic Field,” in Wikipedia … https://en.wikipedia.org/wiki/Earth%27s_magnetic_field ..
“The varying conditions in the magnetosphere, known as space weather, are largely driven by solar activity. If the solar wind is weak, the magnetosphere expands; while if it is strong, it compresses the magnetosphere and more of it gets in. Periods of particularly intense activity, called geomagnetic storms, can occur when a coronal mass ejection erupts above the Sun and sends a shock wave through the Solar System. Such a wave can take just two days to reach the Earth. Geomagnetic storms can cause a lot of disruption; the “Halloween” storm of 2003 damaged more than a third of NASA’s satellites. The largest documented storm occurred in 1859. It induced currents strong enough to short out telegraph lines, and aurorae were reported as far south as Hawaii.” –from “Earth’s Magnetic Field,” in Wikipedia … https://en.wikipedia.org/wiki/Earth%27s_magnetic_field ..
We humankind are Earth’s children. Our nervous systems dance to the tune of her magnetosphere and ionosphere. When the latter are dynamically in motion, then so are our own nervous systems, which depend upon the energies of magnetism and electricity. It is clear from Markus Varik’s above-reference image of the 16 March 2019 equinox crack, that geostorms make the magnetosphere and the ionosphere more chaotically dynamic … less static. During geostorms, we can anticipate more nervous system excitability (as evidenced by findings in the “Experimental Neurology” article referenced above). Then, because the ionosphere and the magnetosphere will become less static … more dynamic … during geostorms, we can anticipate more feelings of physical pain … and possibly also emotional pain … during geostorms. If the pain dampening response to static electromagnetic mats alluded to by the NIH webpage might infer a wider nervous system dampening response, then the non-static nature of geostorms might support temporary excitement of the nervous system, including, possibly, temporary excitement of clair perception. Link: “Tips on Viewing the Aurora,” at SWPC/NOAA … https://www.swpc.noaa.gov/content/tips-viewing-aurora .. This entry was posted in Almanac: solstice - equinox - moon cycles, Alternative medicine, Clair senses, Health - healing, Plane of Forces: electricity - gravity - magnetism - fohat - prana - kundalini, Solar events - geostorms and tagged Alternative medicine, Clair senses, electricity, geostorms, health, magnetic cracks, magnetism, nervous system, pain, solar events, Spring Equinox 2019 on 18 March 2019 by Alice B. Clagett. Link: “Ways to Shelter from the Noosphere during Solar Events,” by Alice B. Clagett, Published on 24 May 2016 … https://wp.me/p2Rkym-5j2 ..
Link: “Natural Geoshelters from the Noosphere during Solar Events,” by Alice B. Clagett, Published on 2 June 2016 … https://wp.me/p2Rkym-5lS ..
Link: “Solar Storm Geoshelters,” by Alice B. Clagett, Published on 4 February 2018 … https://wp.me/p2Rkym-8iy .. This entry was posted in A - My Favorites, Astrogeophysics - EMF - hologram, Solar events - geostorms and tagged astrogeophysics, geoshelters, geostorms, my favorites, solar events on 11 January 2019 by Alice B. Clagett. Will Solar Cycle 25 Continue the ‘Milding’ Trend? What Is the Likelihood That Social Unrest Will Occur at Times Other than those of Solar Cycle Maxima? SWPC/NOAA has come out with a great space weather graph of Solar Cycle 24 (which is just now ending), and half of Solar Cycle 23, which preceded it. The below chart shows the Planetary Ap Index for most of the current Solar Cycle 24, which began in December 2008 and is thought to have ended in mid-2018, and the prior Solar Cycle 23, which lasted from August 1996 to December 2008. I note the much greater amplitude of the Planetary A-Index swings during Solar Cycle 23, and especially the standout upswing in 2003. I wondered why the graph shows the Planetary A-index, rather than the accustomed Planetary K-index. I found out that the Planetary A-index “provides a daily average level for geomagnetic activity. 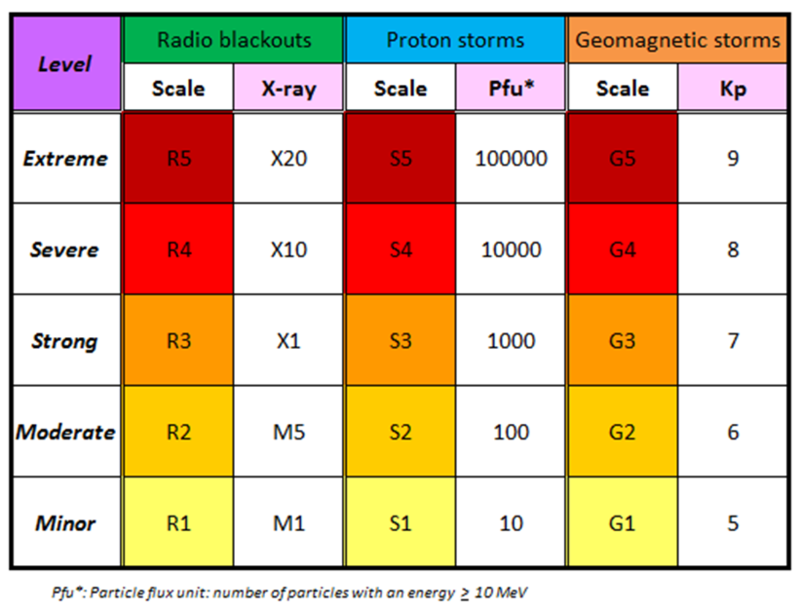 Because of the non-linear relationship of the K-scale to magnetometer fluctuations, it is not meaningful to take the average of a set of K-indices. What is done instead is to convert each K back into a linear scale called the ‘equivalent three hourly range’ a-index … –from “K-index,” by Wikipedia, https://en.wikipedia.org/wiki/K-index … CC BY-SA 3.0 .. Image: “400 year sunspot history, including the Maunder Minimum .” This figure was prepared by Robert A. Rohde and is part of the Global Warming Art project. 23 November 2015 … CC BY-SA 3.0 .. Image: “400 year sunspot history, including the Maunder Minimum .” This figure was prepared by Robert A. Rohde and is part of the Global Warming Art project. 23 November 2015 … from Wikimedia Commons … CC BY-SA 3.0 ..
“This figure summarizes sunspot number observations. Since c. 1749, continuous monthly averages of sunspot activity have been available and are shown here as reported by the Solar Influences Data Analysis Center, World Data Center for the Sunspot Index, at the Royal Observatory of Belgium. These figures are based on an average of measurements from many different observatories around the world. Prior to 1749, sporadic observations of sunspots are available. These were compiled and placed on consistent monthly framework by Hoyt & Schatten (1998a, 1998b). “The most prominent feature of this graph is the c. 11 year solar magnetic cycle which is associated with the natural waxing and waning of solar activity. Link: “Solar Cycle 25 Prediction: We find that the polar fields indicate that Cycle 25 will be similar in size to (or slightly smaller than) the current small cycle, Cycle 24,” http://solarcyclescience.com/Predictions/Cycle25_Prediction.png ..
Link: “Discover the Predictions,” by Solar Cycle Science, http://solarcyclescience.com/forecasts.html#Cycle25Prediction ..
LInk: “Solar Activity and Human History,” by Adam Michalec, http://www.oa.uj.edu.pl/A.Michalec/history.html .. I note the table of revolutions and other violent governmental events lists 19 such events during that span of years, at times other than solar maxima ..
Of 19 violent historical events in Europe from years 1750 to 2000, it looks like 15 can be pegged to solar cycle maxima. It seems to me that would imply that the likelihood of such an even occurring at a time other than the solar cycle maximum would be 4/19 x 100 = 21%. Assuming that the European data might be applicable to global social unrest, then about 1 in 5 incidents of social unrest, globally, might be anticipated to occur at times other than those of solar cycle maxima. Link: “Solar Cycle,” in Wikipedia, https://en.wikipedia.org/wiki/Solar_cycle ..
LInk: “Solar Cycle 24,” in Wikipedia, https://en.wikipedia.org/wiki/Solar_cycle_24 .. Intuitively, I will go with the Wikipedia estimate. Very roughly, if Solar Cycle 24 is just now ending, and if Solar Cycle 25 lasts the average 11 years, then it will last from 2019 through 2029. And the next solar cycle maximum might, very roughly, be predicted as occurring in the years 2023-2026.
approximately 20 percent likely during years 2019-2022 and 2027-2029. 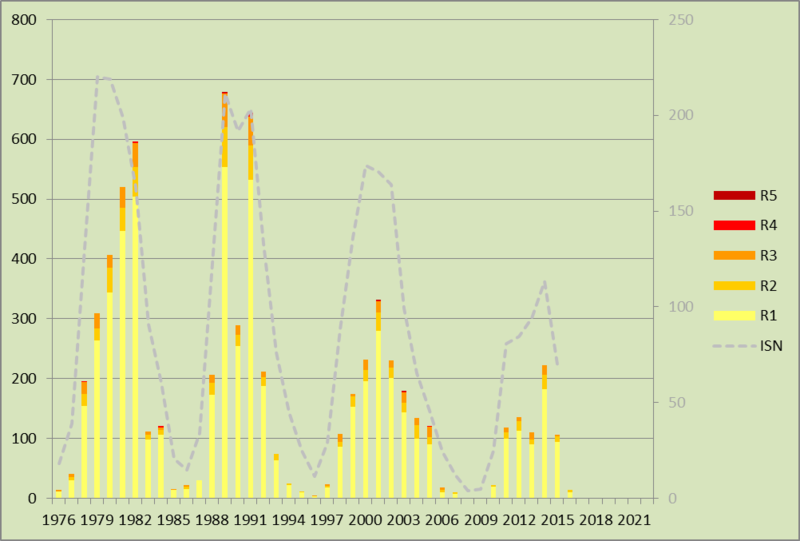 Here are a very good set of graph by the Solar Terrestrial Centre for Excellence … http://www.stce.be/news/366/welcome.html … showing annual data on Space Weather for 1976-2016. Image: Radio Blackouts, Annual Statistics for 1976-2016, by Solar Terrestrial Centre for Excellence, http://www.stce.be/sites/default/files/field/image/Picture2_23.png .. 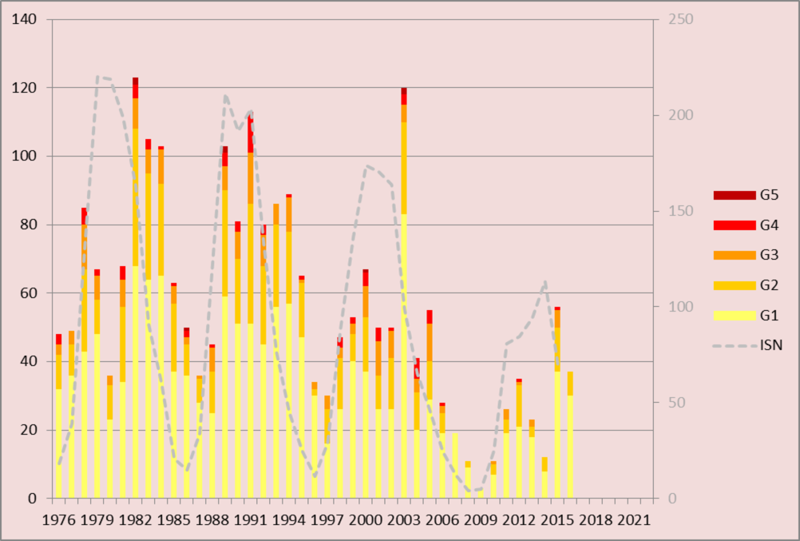 Image: Proton Storms, Annual Statistics for 1976-2016, by Solar Terrestrial Centre for Excellence, http://www.stce.be/sites/default/files/field/image/Picture3_20.png .. 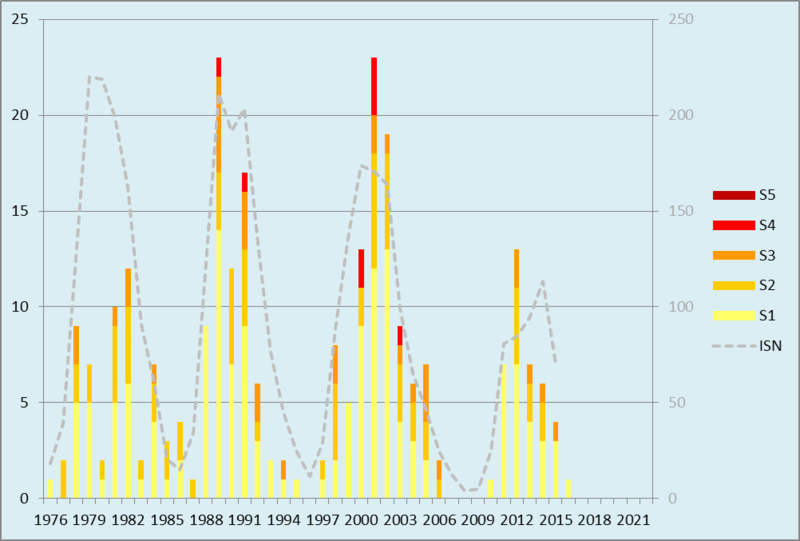 Image: Geomagnetic Storms, Annual Statistics for 1976-2016, by Solar Terrestrial Centre for Excellence, http://www.stce.be/sites/default/files/field/image/Picture4_7.png ..
Link: “Solar Cycles, Thermosphere, Noosphere, and Weather System Transformation,” by Alice B. Clagett, 28 September 2018, https://wp.me/p2Rkym-afK .. This entry was posted in Government, Social unrest, Solar events - geostorms, Weather and space weather and tagged geomagnetic storms, geostorms, Government, NOAA space weather scales, Planetary A-index, planetary K index, proton storms, radio blackouts, revolution, Social unrest, solar cycle, Solar Cycle 23, Solar Cycle 24, Solar Cycle 25, solar events, Solar Terrestrial Centre for Excellence, space weather, space weather prediction, sunspot activity, thermosphere on 25 October 2018 by Alice B. Clagett.